Does project\program develop people-oriented economy in countries-partners? Do two sides have capacity to communicate and cooperate on equal basis? Do partners have a joint system to assess, monitor and avoid negative environmental effects? The gap between the bridge and the riverbank — left by Russia’s failure to build its own, much shorter share of the project — exposes the reality behind the pledges of an ever closer Russian-Chinese partnership made at more and more frequent meetings at the highest level. The Governor of Russia’s Jewish Autonomous Province is enjoying vistas of Chinese half-bridge while inspecting the site where construction should have started two years ago. 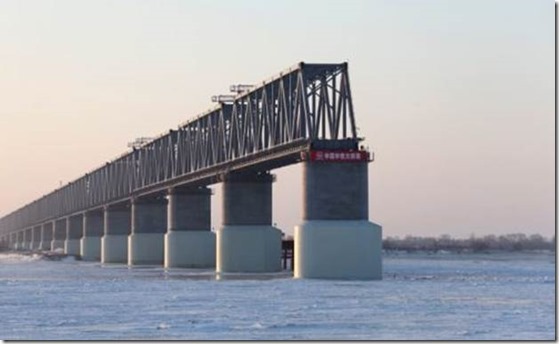 The Tongjiang-Nizhneleninskoye Railway Bridge is a joint project of China and Russia. It has a designed annual shipment volume of 21 million tons. The bridge will reduce the cost of transporting iron ore excavated in Russia to China, shortening the journey to a major Chinese steel mill to just 233 kilometers from 1,040 kilometers at present. In a book on environmental dimensions of Sino-Russian cooperation published in 2010 prominent local economist Dr. N. Lomakina stated that "positive" scenario for Sino-Russian cooperation envisions Chinese investment into ore-processing plants in Russia, while "business as usual" will lead in investment into railroad bridge to export unprocessed ore to China. Now we can guess which scenario prevailed. The Chinese side is responsible for the construction of about 1,900 meters of the bridge and the Russian side for about 310 meters. According to a statement from China’s Ministry of Commerce on July 12,2016 the principal part of the bridge built by the Chinese side has been completed, after construction formally began in June 2014. The Chinese section cost about 2.58 billion yuan ($386 million – which is $203 thousand/one meter). 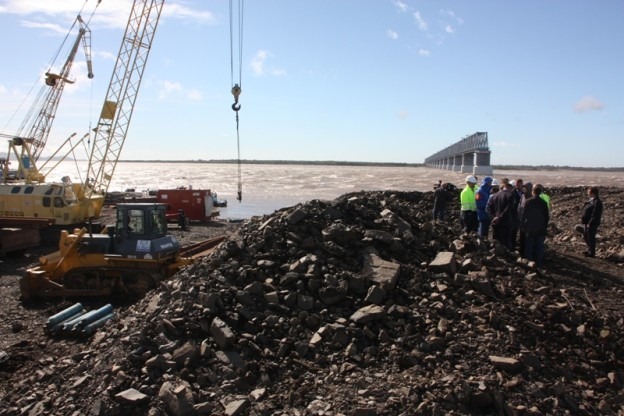 On the Russian side, construction workers and equipment have entered the site to begin preparation, the same statement said, noting that the Russian section is expected to be completed within two years, with costs projected at about 9 billion rubles ($142 million – $458 thousand/meter). Given that in Chinese part we talk about already spent funds, while in Russian those are projected costs subject to overruns, the resulting discrepancy in construction price per one meter of bridge may increase. One may only wonder how it may happen in the times when ruble shrunk by half against both Dollar and Yuan making "Russian goods, services and labor competitively cheap". Usual rubbish about "harsh boreal conditions of Russia increasing project expenditures " cannot explain 2,2 times difference in unit-cost. At the time of contracting the tender-winning firm "SK Most" was owned by Gennady Timchenko – one of personal friends of the President of Russia. Whether the project will be ever completed is still uncertain. The fact that Timchenko in late July 2016 got rid of the contractor-company "SK Most" indicates diminishing Russian state investment into infrastructure projects and decrease in their profitability. 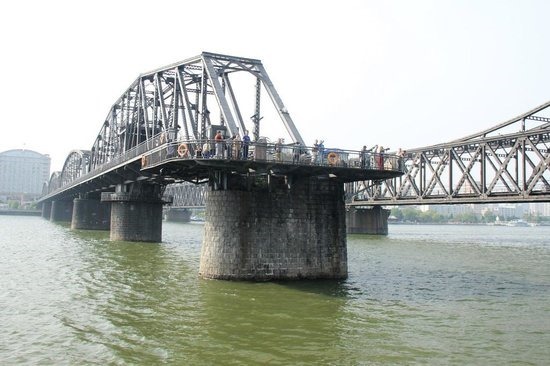 So we cannot rule out a possibility that China side will be left with Tonjiang half bridge and will have to use it as a weird tourist attraction. Twin-structure-the famous tourist attraction Yalu river half-bridge in Dandong on China-North Korea border is a result of bombing during Korean War. 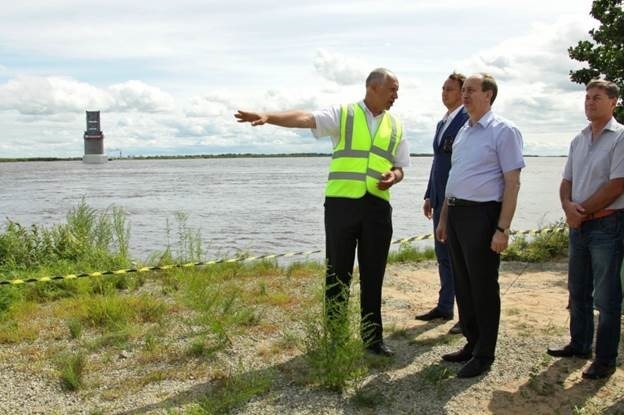 We also could not find any public information on environmental impact assessments of the Bridge project, despite the fact this was envisioned by Sino-Russian Roadmap on EIA Cooperation signed in 2014. However given such discrepancies and misunderstandings in basic project arrangements we would be greatly surprised if joint EIA exists for this project and cooperative system for environmental impact mitigation is in place on the transboundary river. The Tongjiang-Nizhneleninskoye Railway Bridge is a vivid example that shows how fragile and uncoordinated are even the even flagship "Belt and Road" projects, closely watched by leaders of two countries. WWF Environmental risks to Sino-Russian transboundary cooperation: from brown plans to a green strategy.